In the beginning. electric cars were as popular as their gas counterparts as they were quiet and didn't require hand-cranking. This is 1905 Baker Electric. 1996 GM EV 1. This is the car that GM crushed en masse depsite public populatity, as shown in the documentary "Who Killed The Electric Car?" The Zap "Xebra" was a three-wheeled Neighborhood Electric Vehicle that debuted in 2007. SEVA member Deb Seymour was an early adopter with "Zoe ZENN Car" (her 2008 ZENN). This was the car that caused Deb to find and joined SEVA! Electric Cars are something old and new at the same time! Electric vehicles are making a current day resurgence, but have a history that goes all the way back to the 1830s when, according to the Library of Congress, Scotland’s Robert Anderson created the first electric carriage some 50 years prior to Karl Benz’s first gasoline powered horseless carriage. In the 1830s, when Dutch inventor Sibrandus Stratingh created an electromagnetic cart, electric vehicles stood out as the cleaner, cost-effective option to the steam or internal combustion engine. Stratingh’s invention evolved into actual cars in the late 1800s that could move at low speeds using rechargeable batteries. Quieter and less noxious than their gas-powered counterparts, these electric cars surpassed them in popularity in the early part of the 20th century. One of the best-selling vehicles of that time was the Columbia Runabout, which could go 40 miles on a single charge and run at speeds up to 15 m.p.h. In addition, Henry Ford’s wife, Clara, drove her own 1914 Detroit Electric in and around Dearborn, Michigan from 1916 until 1930. In the late 1890s electric vehicles (EVs) outsold gasoline cars 10 to 1. Electric Vehicle dominated the roads and dealer showrooms. Some automobile companies, like Oldsmobile and Studebaker, actually started out as successful EV companies, only later transitioning to gasoline-powered vehicles. The first car dealerships were exclusively for EVs. In 1900, for instance, out of the total of 2,370 automobiles found in New York, Chicago and Boston, 800 of those cars were fully electric. Surprisingly, only 400 cars were powered by gasoline and the remaining 1,170 were steam-powered automobiles — popular because at the time steam technology was familiar and proven. Early production of EVs, like all cars, was accomplished by hand assembly. In 1910, volume production of gasoline-powered cars was achieved with the motorized assembly line. This breakthrough manufacturing process killed off all but the most well-financed car builders. Independents, unable to buy components in volume, died off. The infrastructure for electricity was almost non-existent outside of city boundaries – limiting EVs to city-only travel. Another contributing factor to the decline of EVs was the addition of an electric motor (called the starter) to gasoline powered cars – finally removing the need for the difficult and dangerous crank to start the engine. Due to these factors, by the end of World War I, production of electric cars stopped and EVs became niche vehicles – serving as taxis, trucks, delivery vans, and freight handlers. In the late 1960s and early 1970s, there was a rebirth of EVs prompted by concerns about air pollution and the OPEC oil embargo. In the early 1990s, a few major automakers resumed production of EVs – prompted by California’s landmark Zero Emission Vehicle (ZEV) Mandate. Those EVs were produced in very low volumes – essentially hand-built like their early predecessors. However, as the ZEV mandate was weakened over the years, the automakers stopped making EVs – Toyota was the last major auto maker to stop EV production in 2003. But EVs would not die, and a resurgence in EVs began with the Tesla Roadster in 2008. 1834 – Thomas Davenport invents the battery electric car – batteries were not rechargeable. 1859 – Gaston Plante invented rechargeable lead-acid batteries. 1889 – Thomas Edison built an EV using nickel-alkaline batteries. 1895 – First auto race in America, won by an EV. 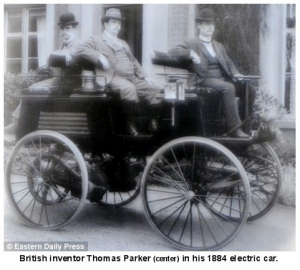 1896 – First car dealer – EVs. 1897 – First vehicle with power steering – an EV. Electric self-starters 20 years before appearing in gas-powered cars. 1898 – NYC blizzard, only EVs were capable of transport on the roads. First woman to buy a car – it was an EV. 1900 – NYC’s huge pollution problem – horses. 2.5 million pounds of manure, 60,000 gallons of urine daily on the streets; 15,000 dead horses removed from the streets each year. 1900 – All cars produced: 33% steam cars, 33% EV, and 33% gasoline cars. 1903 – First speeding ticket – it was earned in an EV. 1904 – America has only 7% of the 2 million miles of roads better than dirt – only 141 miles, or less than one mile in 10,000 was “paved”. 1910 – Motorized assembly produces gas-powered cars in volume; reducing cost per vehicle. 1912 – 38,842 EVs on the road. Horse drawn “tankers” deliver gasoline to gas stations. 1913 – Self-starter for gas cars (10 years later for the Model-T). 1921 – Federal Highway Act. By 1922, federal match (50%) for highway construction and repair (for mail delivery). Before this, roads were considered only “feeders” to railroads, and left to the local jurisdiction to fund. 1957 – Sputnik is launched. The US space program initiates advanced battery R&D. 1966 – Gallup poll: 36 million really interested in EVs. At the time EVs had a top speed of 40 mph, and typical range less than 50 miles. 1967 – Walter Laski founds the Electric Auto Association. 1968 to 1978 – Congress passes more regulatory statues than ever before due to health risks associated with cars: collisions, dirty air. 1972 – First Annual EAA EV rally. 1974 – CitiCar debut at Electric Vehicle Symposium in Washington, DC. By 1975, VanguardSebring, maker of the CitiCar is the 6th largest auto maker in the US. 1990 – California establishes the Zero Emission Vehicle (ZEV) Mandate; requires 2% of vehicles to be ZEVs by 1998, 10% ZEVs by 2003. 1990 – GM shows their production EV initially named Impact; later it was re-named the EV-1. 1990 – US government spent $194 million on all energy efficient research. Much less than the $1 billion for a single day of Desert Storm, or the $1 billion per week of 2003 Iraq conflict. 1993 – GM estimated that it would take 3 months to collect names of 5,000 people interested in the EV-1 – it only took one week! 1995 – Renaissance Cars, Inc begins production of the Tropica. 1996 – EAA helps to hatch CALSTART incubator (for EV research) in Alameda, CA. 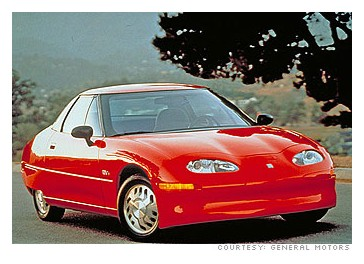 1996 – GM begins production of the EV-1 (formerly called the Impact). 1997 – Toyota Prius hybrid gas-electric vehicle unveiled at the Tokyo Auto Show. 2002 – Toyota RAV4-EV retail sales; their estimated 2-year supply sold out in 8 months. 2003 – California? ZEV Mandate weakened to allow ZEV credits for non-ZEVs. Toyota stops production of the RAV4-EV; Honda stops lease renewals of the EV-Plus; GM does the same for the EV-1. 2003 – AC Propulsion’s tZero earns highest grade at the Michelin Challenge Bibendum; tZero specs: 300 miles per charge, 0-60 mph in 3.6 seconds, 100 mph top speed. 2005 – Commuter Cars’ Tango and AC Propulsion’s eBox EVs ship. 2008 – Tesla Roadster EV ships (0-60 in 3.7 seconds). 2010 – Nissan LEAF ships, GM Volt ships. 2011 – Fisker Karma ships, Th!nk City ships; BMW ActiveE available. 2012 – Tesla Model S, Coda Sedan, Ford Focus EV, Mitsubishi i-MiEV, Toyota Rav4-EV ships. 2013 – Nissan reaches 50,000 LEAFs sold worldwide. 2013 – The quickest Motor Cycle UP the famous Pikes Peak Hill Climb for 2013 was ELECTRIC, beating all Gas Powered bikes. 2014 – Nissan reaches 100,000 LEAFs sold worldwide.